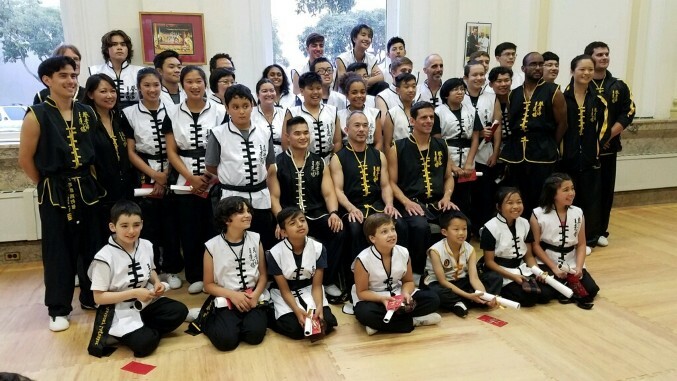 On Saturday, August 18, 2018, students from San Francisco and San Mateo Tat Wong Kung Fu Academies and affiliate school, One Tribe Martial Arts gathered for our 2018 Summer Black Belt Test. and 2nd Degree Black Belt recipients: David Besio, Amanda Burgess, Kenneth Chen, Steven Kao. These fine instructors demonstrate that in Kung Fu, learning never stops. of perseverance, focus, energy, skill, and confidence from these Black Belt candidates (and now Graduates). congratulations to these Kung Fu families who get to enjoy the rigors and rewards of training and testing together. Coming back is hard – but the journey and achievements are worth it! but in high school she decided to start again, and got her black belt just before going to UC Berkeley. Sulastri Carr made reaching black belt her priority before her upcoming move to Colorado. She came four or five times a week and trained hard and she achieved her goal. The accomplishment of receiving a Black Belt is a memory that lasts a lifetime. Congratulations for your hard work and achievements!